Gomes started dancing at a young age and left his home in Brazil at 13 to study in the United States, eventually landing his first contract with ABT at only 17 years old. In 2003, he came out publicly on the cover of The Advocate, making waves that were felt throughout the ballet world. In his mid-thirties for most of the film, Marcelo is very aware that his career is in its final act. He discusses the stress that dancing has placed on his body, and almost right on cue, he suffers an ankle injury that will plague him for the rest of the film. The documentary really hits its stride when his travels bring him back to his home in Rio de Janeiro. In addition to exploring his roots, we watch as he attempts to rebuild his relationship with his distant father and reconnects with family and friends who helped inspire his journey. Fans of ballet will marvel at the stunning performances included in the film. But even those who don’t know a dance belt from a leotard will be struck by the incredible human story of a man who has achieved everything but never stops striving for more. 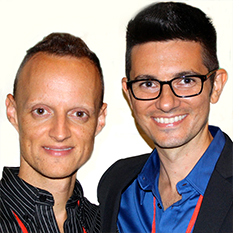 We welcome Directors David Barba and James Pellerito as our special guests. David and James will be available for Q&A following the screening. David Barba was born in Monterrey, Mexico and raised in Mexico City. James Pellerito was born and raised in Vicenza, Italy, near Venice. Barba and Pellerito met in New York where they received their MFAs in Film at the Columbia University School of the Arts. They directed, produced, filmed, and edited their first feature documentary Pop Star On Ice, which screened at festivals worldwide, had a theatrical release at IFC Center in New York and aired on Sundance Channel and LOGO. Barba and Pellerito created, directed, and executive produced two seasons of their television series Be Good Johnny Weir which aired on Sundance Channel and LOGO. Their second feature documentary American Cheerleader had its national theatrical release through Fathom Events. Anatomy of a Male Ballet Dancer is their third feature documentary. The film featuring Brazilian ballet star Marcelo Gomes won the Audience Award at the Full Frame Documentary Film Festival.